, a gentleman of considerable learning and political knowledge, was born in 1722, and educated at Lincoln. His first appearance in public life was when appointed secretary to the commissioners for trade and plantations in 1745, subjects with which he must have made himself early acquainted, as he had not yet reached his twenty-fourth year. In 1753 he went to America, and in the following year was concerned in a matter which eventually proved of great importance. At the beginning of what has been called the seven years’ war with France, which commenced in America in 1754, two years before it broke out in Europe, a number of persons, styled commissioners, being deputed from each colony, assembled at Albany, to consider of defending themselves against the French, who were making alarming encroachments on their back settlements. This assembly was called the Albany Congress, and became the precedent for that other more remarkable congress established at the revolution in 1773. 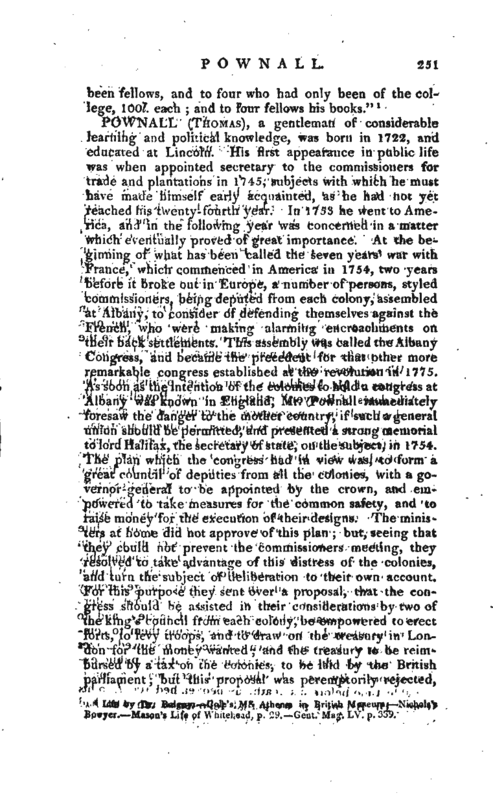 As soon as the intention of the colonies to hold a congress at Albany was known in England, Mr. Pownall immediately foresaw the danger to the mother country, if such a general union should be permitted, and presented a strong memorial to lord Halifax, the secretary of state, on the subject, in 1754. The plan which the congress had in view was, to form agreat council of deputies from all the colonies, with a governor-general to be appointed by the crown, and empowered to take measures for the common safety, and to raise money for the execution of their designs. The ministers at home did not approve of this plan; but, seeing that they could not prevent the commissioners meeting, they resolved to take advantage of this distress of the colonies, and turn the subject of deliberation to their own account. 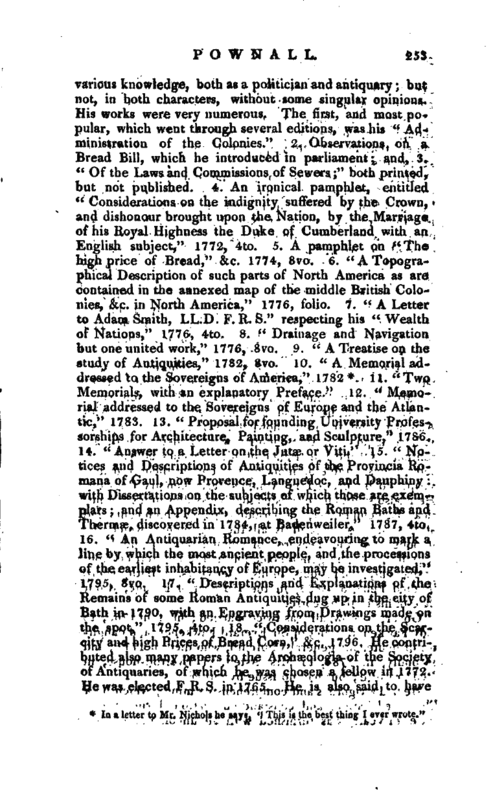 For this purpose they sent over a proposal, that the congress should be assisted in their considerations by two of the king’s council from each colony, be empowered to erect forts, to levy troops, and to draw on the treasury in London for the money wanted and the treasury to be reimbursed by a tax on the colonies, to be laid by the British parliament; but this proposal was peremptorily rejected, | because it gave the British parliament a power to tax the colonies. Although Mr. Pownall did not agtee with the ministry in the whole extent of their proposal, yet they thought him so well acquainted with the affairs of the colonies, that in 1757 they appointed him governor of Massachusetts bay. After two years’ residence, some political differences with some of the leading men of the province, induced him to solicit to be recalled; and in 1751) he succeeded Mr. Bernard as governor of New Jersey but he retained his post a very short time, being almost immediately appointed governor, captain -general, and vice-admiral, of South Carolina. Here he continued until 1761, when he was recalled, at his own desire and on his arrival in London, he was appointed director-general of the office of controul, with the rank of colonel in the army, under the command of prince Ferdinand, in Germany. At the end of the war he returned to England, where his accounts were examined, and passed with honour. 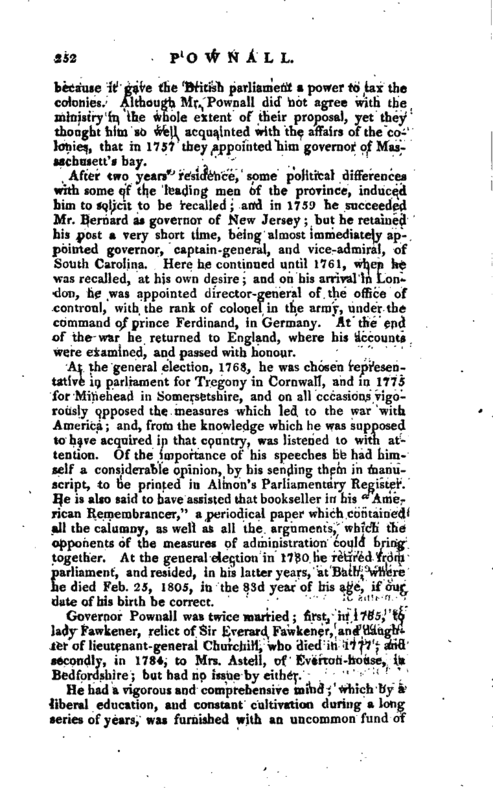 At the general election, 1768, he was chosen representative in parliament for Tregony in Cornwall, and in 1775 for Minehead in Somersetshire, and on all cccasions vigorously opposed the measures which led to the war with America; and, from the knowledge which he was supposed to have acquired in that country, was listened to with attention. 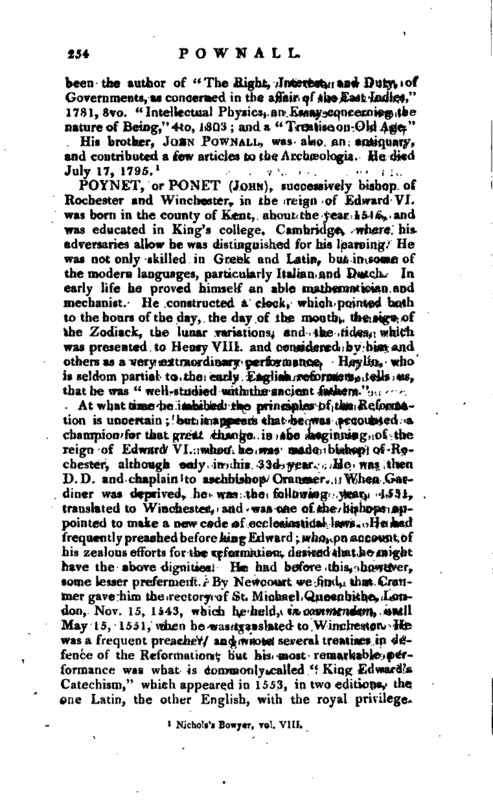 Of the importance of his speeches he had himself a considerable opinion, by his sending them in manuscript, to be printed in Almon’s Parliamentary Register. He is also said to have assisted that bookseller in his “American Remembrancer,” a periodical paper which contained all the calumny, as well as all the arguments, which the opponents of the measures of administration could bring together. At the general election in 1780 he retired from parliament, and resided, in his latter years, at Bath, where ie died Feb. 25, 1805, in the 83d year of his age, if our date of his birth be correct. Governor Pownall was twice married first, in 1765, to lady Fawkener, relict of Sir Everard Fawkener, and daughter of lieutenant-general Churchill, who died in 1777 and secondly, in 1784, to Mrs. Astell, of Everton-house, in Bedfordshire; but had no issue by either. | been the author of” The Right, Interest, and Duty, of Governments, as concerned in the affair of the East Indies,“1781, 8vo.” Intellectual Physics, an Essay concerning the nature of Being,“4to, 1803 and a” Treatise on Old Age." 1 Nichols’s Bowyer, vol. VIII.